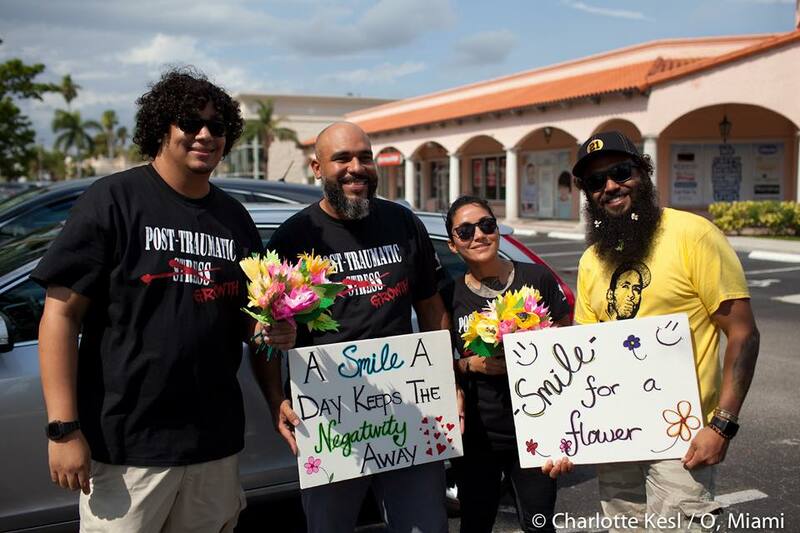 Petaling Peace is a collaborative project between the annual poetry festival O, Miami and The Combat Hippies – an ensemble of Puerto Rican military veteran performing artists. 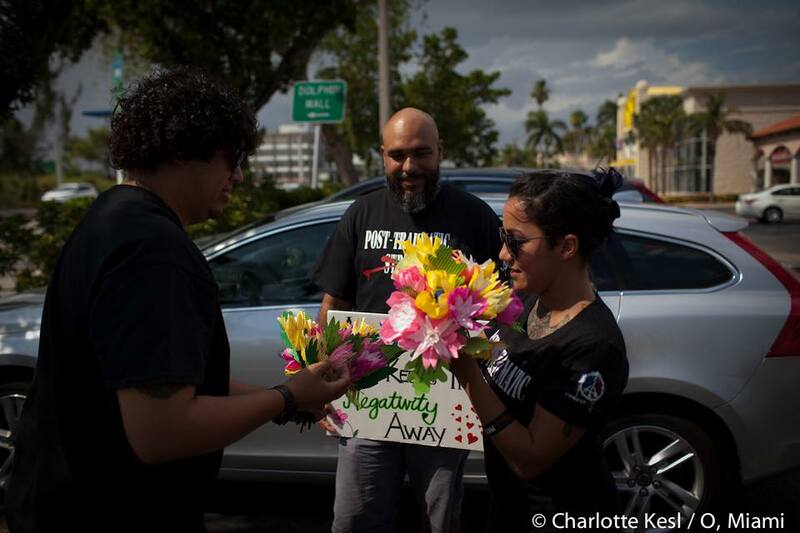 The Combat Hippies worked with artist Amancio Paradela and community members to create and distribute handmade paper flowers inscribed with poems of peace and love in the busy intersections of Doral during the festival. 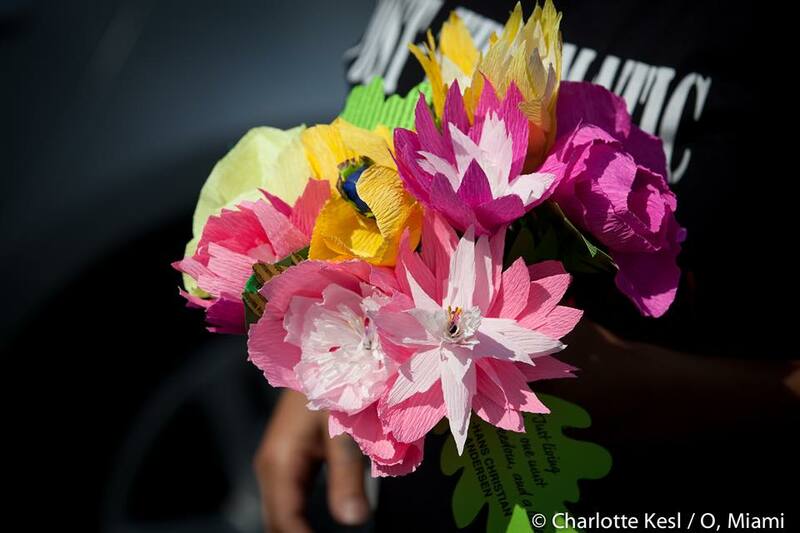 There is one quote per flower with messages such as, “Peace cannot be achieved through violence, it can only be attained through understanding,” by Ralph Waldo Emerson. Each member of the Combat Hippies has seen war. They use their individual experience to talk about the impact of violence and the path to healing. During a performance at AWP this year, one of the Combat Hippies, Hipolito Arriaga, delivered one of his poems while bending one arm back and extending the other toward the audience, as though he were looking through the sight of a gun. These spoken word performances, in conjunction with the Petaling Peace project, aim to initiate a dialogue about the universality of trauma while also striving to connect veterans from around the world in order to reduce stigmas and increase mutual understanding. The Combat Hippies also use their projects to provide insight and raise the voices of refugees, asylum seekers, and survivors of torture. In each performance, they seek to incorporate a local veteran, a refugee, or a person of Middle East/Arab descent. Their hope is that this project will help shift the perspective of those perpetuating Islamophobia and xenophobia as well as de-stigmatize Post-Traumatic Stress and other social issues. AMAL is currently in production and will be having its premiere performance at MDC Live Arts Lab, located in Miami in March of 2019. MDC Live Arts is the lead commissioner for AMAL, but they are also supported by a two-year Knight Arts Challenge Grant for the production of this project. Torres describes the project as, “…an exploration of shared experiences of both trauma and resilience between people of color who fight in war and those forced to flee war.” Their pieces, which they have been researching, writing, and workshopping together will explore the parallels between the impact of war on oppressed people and governments who have attacked its own citizens. They will also be using the topographical swirl, nature, and impact of hurricanes as a metaphor for this piece; percussionist Angel Rodriguez, Sr. will be placed center stage to represent the eye of the storm. Playing Batá drums and using bomba rhythms throughout the piece, Rodriguez will use a rotating stool to spin while the storyline and spoken word pieces are taking place. Torres says, “Angel will represent the mythical god Juracán and will also serve as a jester within the piece, antagonizing the other performers.” They’re using Carl Jung’s theory of human archetypes as inspiration for characters. If you’re looking forward to seeing this dialogue about war and personal experience conveyed through the familiar Florida imagery of hurricanes, make a trip to Miami in March 2019 to see their performance of AMAL. Or be on the lookout for the Combat Hippies poetry performances in your city. 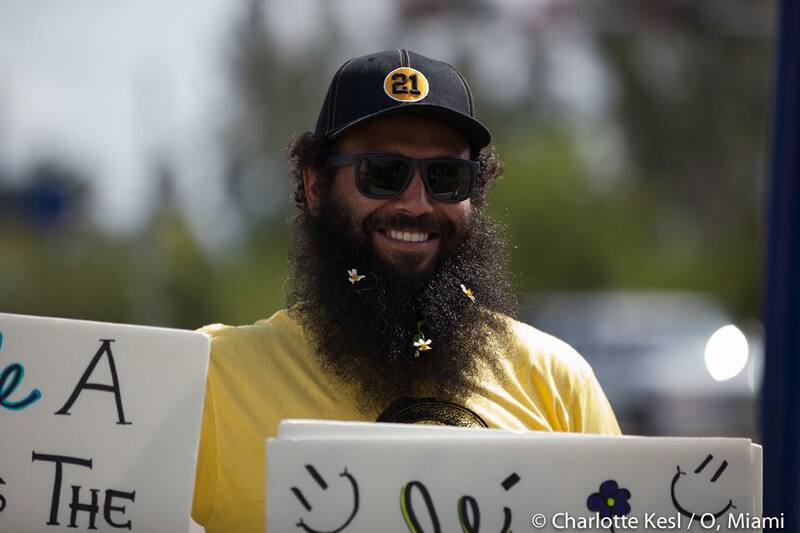 You never know, they may be passing out flowers with poetry.